Does a dog breed with an unpredictable personality intrigue you? Do you love long walks, and want a dog that’ll be a faithful companion and friend? 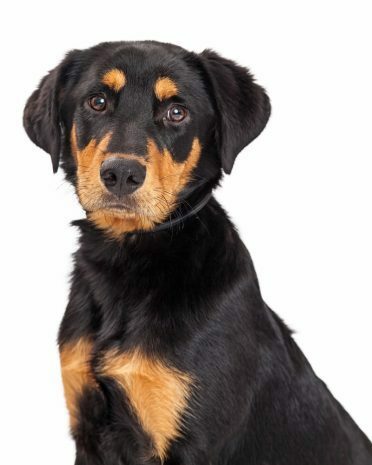 If so, the Rottweiler Lab Mix might be the perfect pet for you. When you combine a Rottweiler and Labrador, you get an incredibly cute puppy. So, it’s no wonder they’ve become increasingly popular with dog owners. In light of this, we’ve devoted an entire article to this beautiful dog breed. Let’s dive in! What Can You Expect From a Rottweiler-Lab Mix? What Do Lab Rottweilers Look Like? Do Lab Rottweilers Need a Lot of Grooming? Is There Anyway of Counteracting Their Aggression? Who’s the Ideal Owner for This Breed? Do Lab Rottweilers Suffer from Any Health Conditions? Any Advice on Buying a Lab Rottweiler Mix? How Much Does a Rottweiler Lab Mix Cost? 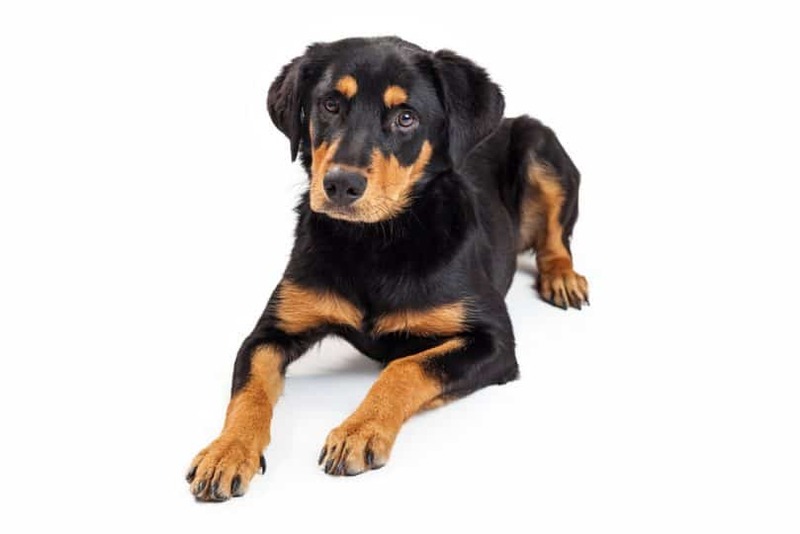 Like other crossbreeds, significant breed associations like the American Kennel Club don’t recognize the Rottweiler Lab Mix. Although dedicated breeders would strongly argue that they should be. Now we’ve clarified that, what should you expect from a Rottweiler Lab Mix? To put it simply, there isn’t a definite result. You could get a dog with the personality of a Lab, but with the coloring of a Rottweiler, or vice versa. This means a pup could have any combination of characters and colorings. The beauty of this breed is that you never know what you’re going to get- which isn’t ideal if you want a pup with specific characteristics. The size of a Lab Rottweiler Mix can vary. Unfortunately, you can’t be sure of their full size until they are fully grown. 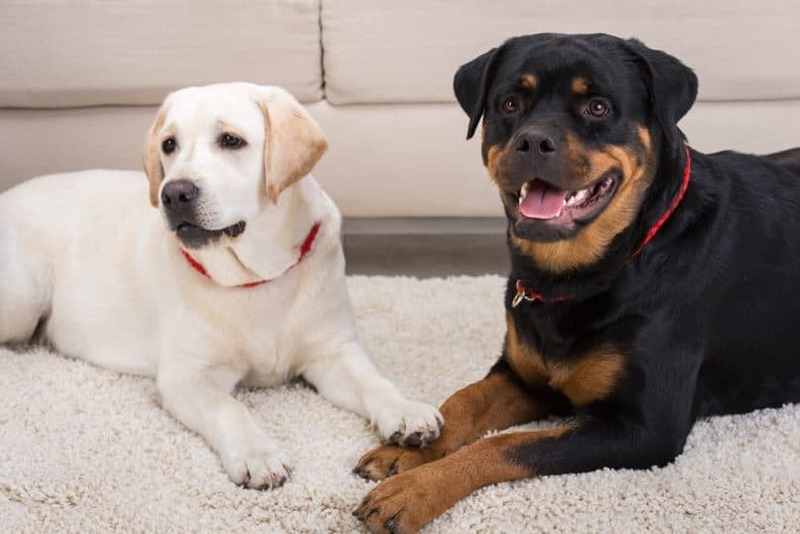 Labradors and Rottweilers are different sized dogs, meaning that a Rottweiler Lab can fall anywhere between the full weight of a 65-pound (29.5 kg) Lab to a 110-pound (40.9kg) Rottweiler. The same principle applies to height. Rottweilers typically grow to 27 inches (68.6 cm) to the shoulder. Whereas, Labradors are a little shorter, at 24.5 inches (62.2cm). If you don’t want a dog as big as a Rottweiler, steer clear of Labrottie pups; it’s always best to play it safe and opt for a smaller size dog. However, unlike its sizing, you can be confident this pup will have short fur. Although, the style of the coat can differ depending on the prominent parental gene. Rottweiler Labs have either straight or wavy hair, both of which look adorable! Typically, the head and muzzle of these dogs resemble the Labrador, whereas, the body is more comparable to a Rottweiler. Their heads are usually broad, and they’ve cute floppy ears that give them a friendly appearance. No, is the short answer to this question. Both parent breeds have coats that require little maintenance. We recommend brushing your pet’s fur with a soft bristled brush once a week. They shouldn’t need more than that to keep their beautiful coats in check. However, Labradors shed a lot during the summer months because they have a ‘double coat’ to keep them warm during winter. Naturally, as it gets warmer, they get rid of their excess fur. This means your Rottweiler Lab Mix may need more regular grooming. Not all Labrotties inherit this feature. You’ll have to wait and see whether this affects your pup. Trust us, you’ll know about it. Keep your vacuum at the ready to clean up after they’ve finished napping on the sofa! As we’ve already said, you won’t know how the mix of personalities from their parents will affect your pup until he’s older. So, make sure you’re fully aware of what you’re getting into before you get one. On the whole, Labradors tend to be faithful retriever dogs. They’re ever so friendly and tend to be comfortable around all kinds of people. If your lucky, your pup will inherit these fabulous qualities. On the flip side, a Rottweiler Lab Mix may inherit the characteristics of a Rottweiler. This breed is famous for being an excellent guard dog, so they have a natural distrust of strangers. Occasionally, this can cause them to be aggressive towards people they don’t know- which isn’t ideal, especially, if children are involved. In a nutshell, they’re fun, energetic and have a ton of stamina. If you enjoy going for long walks and love to play with your dog, they’ll make the perfect companion. Due to their protective instincts, they’re fiercely loyal to their owners. 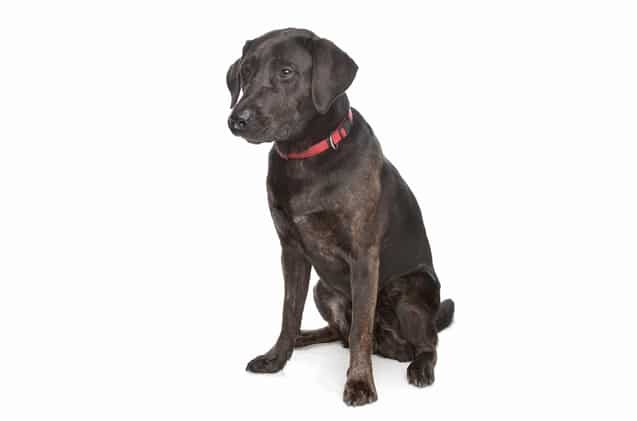 If that’s the sort of dog you’re after, then the Rottweiler Lab Mix is a perfect choice! They’re usually incredibly affectionate and devoted to the people they live with. Don’t be surprised if they follow you all over the house, which is super cute! If you have kids, this breed might not be the best choice for you. Their aggressiveness can range anywhere from barking at strangers walking up your driveway to a full-on attack. As we’ve already said, you won’t know whether your pups inherited these traits until they’ve grown up, by which time, it’s too late. Sadly, Rottweilers are responsible for a disproportionate amount of dog attacks, the majority of which are children. According to Dogsbite.org, from 2005 to 2015 Rottweilers were responsible for the deaths of 42 Americans and most of them are children. There’s a large body of evidence that suggests this has more to do with environmental factors, such as the way owners raise their pups. However, you can’t ignore the stats. Although these dogs are generally good with their families, this doesn’t always extend to strangers, particularly the friends of your kids. The same principle applies to other pets. You need to give your Lab Rottweiler plenty of attention during the day. Otherwise, they’ll get bored and destroy your stuff. You can kiss goodbye to your pristine sofas and favorite shoes if you’re out of the house a lot! Leaving them alone for long periods of time not only triggers destructive behavior, but it can also cause separation anxiety. The last thing you want is for your pet to be unhappy. If you don’t have enough time to dedicate to this dog, we strongly suggest opting for a lower maintenance breed. The best way to combat their aggression is to socialize them as much as possible as early as you can. Introduce your dog to lots of other dogs and different kinds of people from the offset. Introducing them to strangers while they’re puppies is critical. As puppies, this breed is supremely confident. In the wild, their family would protect them, so at this stage, they know no fear; which is why it’s best to make the most of this period. Then, by the time they’re fully grown, you’ll have hopefully quashed their instinctive distrust of strangers. A Rottweiler Lab Mix is best suited to a child-free household, where someone is around for most of the day. You should have time to take your dog on long walks. So grab your walking shoes and a coat and be prepared to get active! Labrador Rottweiler Mix gains weight really quickly if they don’t exercise enough, this can lead to obesity and other health issues. Ideally, you should take your Rottie on at least two 30 minute walks daily. You should also be an experienced dog handler. These dogs aren’t ideal for first-time dog owners. Lab Rottweiler puppies need a lot of training from the offset, which can be incredibly overwhelming if you’re a novice. 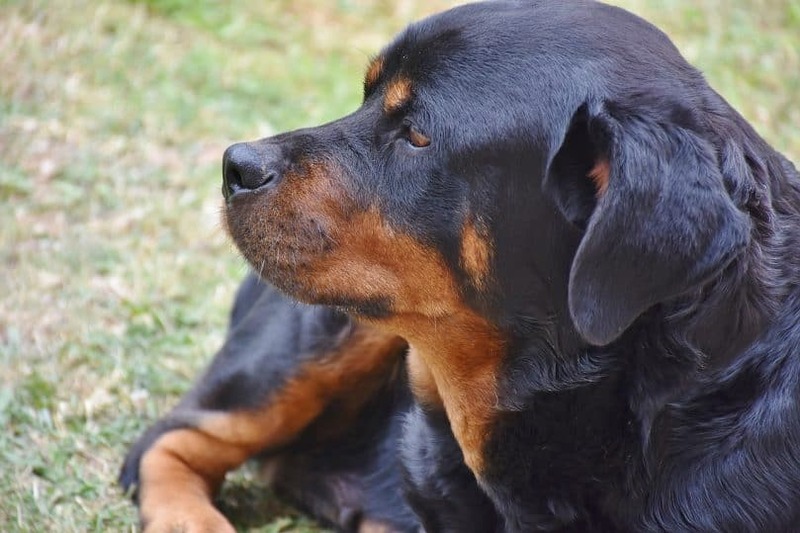 Due to their mixed lineage Lab Rottweilers are generally healthier than their pedigree parents. However, they’re still prone to a fair few ailments. It’s standard for both Labradors and Rottweilers to suffer from hip dysplasia. In layman’s terms, their hips aren’t formed correctly. If left untreated, the disease can cause the bone to gradually deteriorate and eventually result in the hip joint losing all function. Hip dysplasia can also trigger a disease called degenerative joint disorder. This refers to the progressive deterioration of the cartilage surrounding the joints, the damage is sadly irreversible. As many as 11% of Labradors and 20% of Rottweilers suffer from this. If it looks like your pet’s legs are stiff, take them to the vets immediately before their ailment gets any worse. If you’re considering buying a Labrador Rottweiler Mix, always inspect the parents before you buy a puppy, especially the Rottweiler. This is where their potential guarding instincts will come from so you want to make sure they’re friendly with strangers. Obviously, this doesn’t mean your pup won’t inherit these features, but it does give them a better chance. Their most recent eye test results. You want to know whether they’re clear of PRA (Progressive Retinal Atrophy). This is a disease that causes a loss of central vision and is especially prevalent in labradors. It’s always better to ensure your pup comes from healthy stock. Although it doesn’t guarantee it won’t get sick, it certainly gives it the best possible chance. Most importantly, you need avoid ‘backyard breeders’ at all costs. You should only ever get a pup from a breeder who asks lots of questions about how you’ll care for your new puppy. Breeders who care for both the parents and the puppies won’t sell unless they feel the pups are going to a good home. We strongly urge you to support breeders who want the best for their animals. Or, you could adopt a Lab Rottweiler Mix via one of the organizations listed by adoptapet.com. A Lab Rottweiler pup usually costs anywhere between $300-$600. We also recommend budgeting between $485-$585 each year for their medical care, and a further $515-$615 for food, training, and other pet accessories. Be sure to consider these expenses before taking on the responsibility of a new pup. Dogs just like children are a financial drain, so analyze your finances before you commit. Although first-generation Rottweiler Labradors are a bit of an enigma when it comes to deciphering their personalities, they’re a beautiful dog. If you’re interested in getting one, you need to do your research and commit to finding a reputable breeder. If your idea of heaven is spending lots of time with your canine companion and going for long walks, then a Labrador Rottweiler Mix would be the perfect pet. They need a ton of attention, so be prepared to have a new partner in crime! Thanks for sticking with us. Let us know in the comments if you’re thinking of getting a Rottweiler Lab mix, or already own one; we’d love to hear from you!